NEW ORLEANS – Division I co-men’s National Athlete of the Week Kirubel Erassa of Oklahoma State may not have secured any NCAA qualifying marks at the Big 12 Championships with his gutsy three-title performance, but his effort did clinch a bigger, more universal prize: Oklahoma State’s first-ever indoor conference team title. His mile-3000-5000 triple in Ames, Iowa, over the weekend shared the U.S. Track & Field and Cross Country Coaches Association’s (USTFCCCA) top weekly individual honor in Division I with the record-breaking quarter miler from Texas A&M, Deon Lendore. 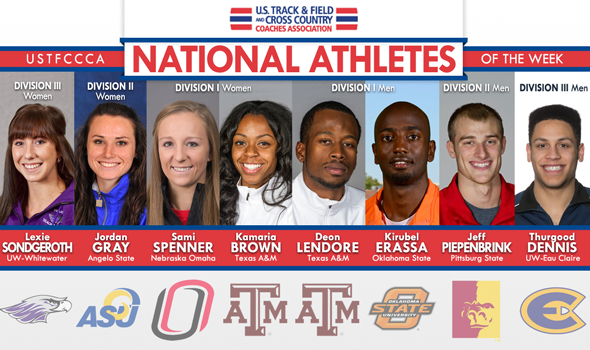 The Division I honors were also split between Kamara Brown’s (Texas A&M) world-leading revision of the all-time indoor 200 meter and 400 meter collegiate performers lists and Omaha’s Sami Spenner scoring a titanic 60 points at the Summit League Championships. Lendore and Spenner are repeat winners from February 3. Jeff Piepenbrink of Pittsburg State claimed the DII honor after his pole vault title and heptathlon runner-up finish pushed the Gorillas to the MIAA title. The DII women’s honor went to Angelo State’s Jordan Gray, who turned in a pair of national top-five, winning performances in the long jump and pentathlon and scoring performances in three other events at the Lone State Conference meet. Thurgood Dennis of UW-Eau Claire posted two DIII-leaders at 60 and 200 meters and ran two legs of two winnings relays to edge out new DIII mile record holder Coby Horowitz of Bowdoin for the DIII men’s award. The WIAC also produced the women’s winner, with Lexie Sondgeroth of UW-Whitewater. She moved into the top 10 all-time DIII performers list in both the long jump at 200 meters events with conference titles, and nearly garnered at third win at 60 meters. Find out more about each student-athletes’ performances below or by clicking their name above to go directly to their section. National Athletes of the Week are announced each Monday throughout the season, with male and female awards for all three NCAA Divisions. Nominations are open to the public and can be completed here. Up to two honorable mention selections will be made for each gender per NCAA Division. Won the SEC indoor 400 meters title in a collegiate-leading 45.03 over The Bowerman Watch List rival Arman Hall of Florida and three others under 46 seconds. The performance equals both the No. 4 position on the all-time collegiate performers list and the No. 6 position on the all-time world list, both by Torrin Lawrence of Georgia in 2010. It also established a new Trinidad & Tobago record, ahead of his 45.15 from 2013. Anchored the Aggies’ collegiate record-breaking 4×400 relay team to a 3:03.20 with a split of 44.63. His third sub-45 indoor split is more than anyone else in history, and the relay team was equal to No. 4 on the all-time world list (Great Britain, 1999). The previous collegiate record of 3:03.50 (Arkansas, 2013) was matched by runner-up Florida. Also ran a 45.47 in the prelims of the 400 meters. Rather than just chasing qualifying marks in one or two events, Erassa took one for the team and gritted out three individual titles in the mile, 3000 meters and 5000 meters en route to clinching the Cowboy’s first-ever indoor conference title by just 4 points over Texas, 112½ – 108½. Clinched the team title for OSU with a meet-record 7:53.53 at 3000 meters, which puts him just outside the bubble to qualify for NCAAs. Earlier in the day won the mile in 4:15.94, after winning the 5000 in 14:11.29 and running a 4:15.68 mile in the prelims. Arman Hall, Florida – Won the 200 (20.59) over collegiate leading teammate Dedric Dukes, finished runner-up to Lendore at 400 meters (45.28) and ran 44.91 anchor on the runner-up 4×400 to tie the former collegiate record of 3:03.50. Blazed to all-time great performances at 200 and 400 meters in winning SEC titles in both events. Set the 2014 world lead at 200 meters in a school-record 22.50, defeating The Bowerman Watch List rival Dezerea Bryant by more than a quarter of a second, after running a 22.51 in the prelims. She is now ranked as the No. 5 performer in collegiate indoor history with two of the eight fastest times, and is the only performer to record her times somewhere other than Arkansas. She also moved to No. 5 on the all-time US list with the sixth and equal-to-seventh fastest performances in American history. Her winning 50.94 performance at 400 meters made her just the eighth woman in collegiate history to go sub-51 indoors at No. 8 on the all-time list. It is the second-fastest time in the world in 2014, and the fastest not run at altitude. Not one, not two, not three individual titles for Spenner at the Summit League meet: she earned four individual titles (pentathlon, 60-meter hurdles, long jump, triple jump) and finished runner-up at 60 meters and third at 200 meters and in the high jump for 60 points toward her third-place team’s 109 total. Between finals, prelims and pentathlon events, she was on the track or in the field on 14 different occasions just one week after finishing runner-up at the USATF Indoor Championships in the pentathlon. Won the pentathlon with a score of 4027, the long jump and triple jump with marks of 20-1 (6.12m) and 41-5 (12.62m), respectively, and the 60-meter hurdles in 8.77. Finished runner-up at 60 meters in a personal-best 7.51, and finished third at 200 meters in 24.58 and third in the high jump at 5-7¾ (1.72m). Shakira Nelvis, Akansas State – Won four individual Sun Belt titles– 60 and 200 meters, 60-meter hurdles, long jump – with personal bests at 60 meters and in the 60-meter hurdles, and a 2014-best at 200 meters. Helped lead his Pittsburg State men to the MIAA team title with an individual pole vault title and a runner-up showing in the heptathlon. His winning pole vault clearance of 16-10 (5.13m) was the latest in a string of five performances in 2014 that have concluded with winning heights of greater than 16-9½ (5.12m), and was higher than all but one other vaulter’s best mark in 2014. The collegiate leader defeated a pair of top-seven vaulters in the process, including No. 3 Brady Melugin of Missouri Southern. A personal-best heptathlon score of 5141 earned him eight points as the runner-up. He won the pole vault component and set a PR at 60 meters in 7.23 in finishing third. Drew Windle, Ashland – Defeated two other national top-four 800 meter runners to win the GLIAC title in 1:50.26 and ran legs of the winning 4×400 and DMR teams. Nick Lebron, Southern Connecticut State – Improved his standing as the No. 3 heptathlete in Division II history with a score of 5528 in winning at the NEICAAA Indoor Track & Field Championship, and ran a leg of the 4×400 relay in leading SCSU to the overall team title. Led Angelo State to a runner-up team finish at the Lone Star Conference Championships with a win in the pentathlon and the long jump, a runner-up showing in the 55-meter hurdles, a sixth-place finish in the high jump and a leg of the runner-up 4×400 relay for a total of 33 points. Won the pentathlon with a career-best 3815 points for the No. 4 spot on the national descending order list. Posted the top score in the 55-hurdles and shot put components, and posted a personal-best 5-5 (1.65m) in the high jump. Won the long jump with a career-best 19-8 (5.99m) leap for the No. 2 spot on the DII qualifying list. Ran a career-best 8.06 to finish second in the 55-meter hurdles, which converts to an 8.69 60-meter hurdles mark with altitude for No. 20 in DII. Tabitha Bemis, Edinboro – Won PSAC titles in the 60-meter hurdles (8.60), the long jump (19-2½/5.85m) and the triple jump (39-8¾/12.11m), along with finishing third at 60 meters and running a leg of the runner-up 4×400 relay. Kalena Franklin, Grand Valley State – Contributed 22½ points to Grand Valley State’s GLIAC title with wins at 200 meters (24.57) and in the 60-meter hurdles (8.36), along with a leg of the winning 4×400. Posted two individual Division III-leading times at 60 meters and 200 meters en route to WIAC individual titles, and ran legs of the winning 4×200 and 4×400 relay teams to lead UW-Eau Claire to a runner-up finish in the team race. His victory over a pair of other top-six national sprinters at 60 meters came in 6.75, which gave him the Division III lead and a share of the No. 4 all-time position on the Division III performers list with Dominique Kone of Colby in 2012. The last time a DIII man ran faster was 2003 when Chaz Clemons of Lincoln (Pa.) set the DIII record of 6.69. Won the 200 meters title in 21.77 (21.39 converted for track type) to tie him as atop the DIII qualifying list with Bruce Gray of Greenville, defeating two other top-six sprinters along the way. Coby Horowitz, Bowdoin – Broke the Division III record in the mile in a win at the NEICAAA meet in 4:00.41, besting the previous record of 4:00.96 by Haverford’s Karl Paranya in 1997. James Wilson, Monmouth (Ill.) – Led his team to the Midwest Conference title with a win at 400 meters and in the long jump, a runner0up 200 meters, a third place triple jump, a fifth-place high jump and a fifth-place 60 meters. Notched two all-time top-10 Division III performances en route to individual WIAC Championships titles in the long jump and 200 meters events, along with a narrow runner-up showing at 60 meters to boost her UW-Whitewater team to third in the team standings. Won the long jump by a foot-and-a-half with a DIII-leading leap of 19-10¼ (6.05m) to clinch the No. 4 position on the all-time indoor Division III performers list. Dashed to the top of the 200 meters qualifying list with a 24.70 win (converted to a DIII-best 24.33 for track type). The raw time puts her at No. 5 on the all-time Division III performers list. Finished runner-up at 60 meters by .01 in 7.73 for the No. 8 spot on the DIII qualifying list. Jamie Ludwigson, UW-La Crosse – Won the 60 and 60-meter hurdles at the WIAC Championships, and finished runner-up at 200 meters and sixth in the triple jump.